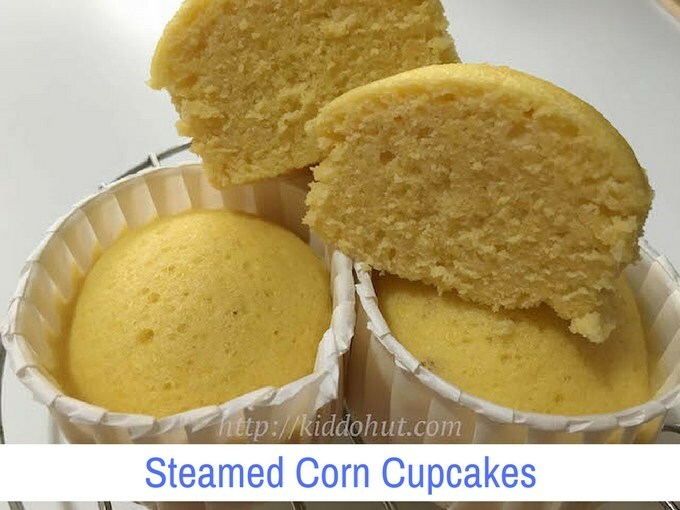 What has inspired me to make this steamed Corn Cupcakes? I have a bag of thawed corns in the refrigerator that was waiting to be made into the Japanese Corn Soup (click here for the recipe) but needed some more filling breakfast for my kiddos. Yet, my tots do not like the corn kernels. So, I have strained the corn juice through a sieve. If you like the crunchiness of the sweet corn, you may add the corn kernels into the batter. Instead of using frozen corns, you may use fresh corns or those in the canned. Personally, I find fresh and canned ones are sweeter compared to the frozen ones but frozen ones are easier vis-a-vis the fresh ones. You may use more corns to yield more intense corn juice, but add lesser water. In my recipe, I have used rice flour as I need to make these cakes gluten-free. It can easily to replace with normal plain flour with the 1:1 proportion. If you have self-raising flour, great, just omit the baking powder in the recipe. There is no need to replace the 2 teaspoons of baking powder with another 2 teaspoons of self-raising flour as it won’t affect the texture much. The usual steaming tips like putting in the cakes into the steamer when the water is boiling hot and do cover the steamer’s cover with a cloth to prevent the water vapour from dripping into the cupcakes while steaming. Alternatively, you may use the bamboo steamer. If you wish to know how a bamboo steamer looks like, you may click here to refer (steamed pumpkin bun / man tou). 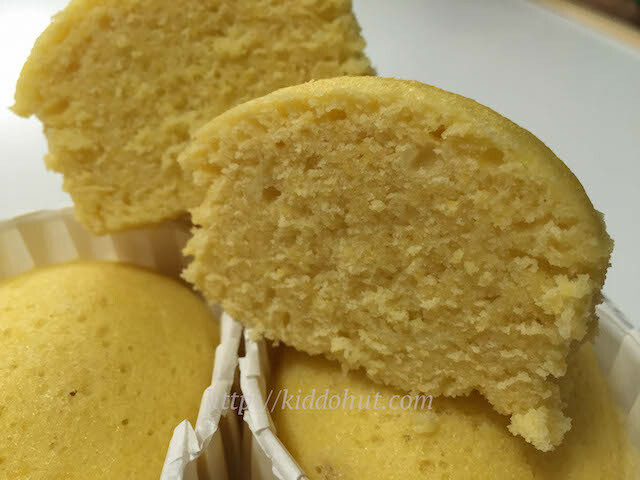 If you like steamed cakes, you may refer to the list by category (click here) and scroll to the Steamed Cupcakes & Cakes for more recipes like steamed orange cupcakes, steamed milk cakes, steamed honey cheese cakes, etc. 2. Strain the blended corn kernels and juice through the sieve, and squeeze the pulps dry. Alternatively, you may use the cheesecloth to strain the mixture. Measure out 100ml of corn juice. 3. Whisk eggs using electric mixer for 3-5 minutes under low speed till well mix, then add sugar continue to whisk on high speed for another 10-15 minutes or until white and light. 4. Prepare the steamer. Add some pandan leaves in the water for steaming for some fragrance. This is optional. Line the cupcake moulds with liners. 5. Sift the flour and baking powder. 6. Quickly fold in a small portion of the sifted flour, followed by the melted butter/olive oil then fold in another small portion of the sifted flour. Followed by a portion of the corn juice, then fold in another portion of the sifted flour. Continue this process until all flour and corn juice are folded in. Start and end with flour. Do not pour all the flour at one go, else it may not be well folded. This process should be done as quickly and gently as possible. After folding in everything, you will see some bubbles forming. 5. If you like some corn kernels in your cupcakes, add the corn kernels into the batter. Pour the batter into the tin / moulds. Knock the tin/moulds few times on the table top to burst the bubbles on top (if you want a smoother top after steaming). 6. Put into the steamer and steam for 20-25 minutes. Do cover the steamer’s cover with cloth to prevent water vapour from dripping in. Test with toothpick, if the toothpick comes out clean, it is cooked. 7. Open the steamer cover and let it cool. Serve.